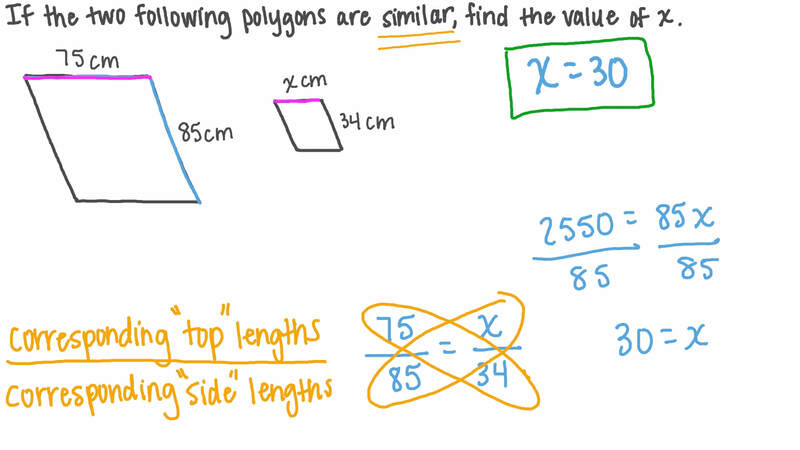 In this lesson, we will learn how to use the properties of similar polygons to find unknown angles, side lengths, scale factors, and perimeters. 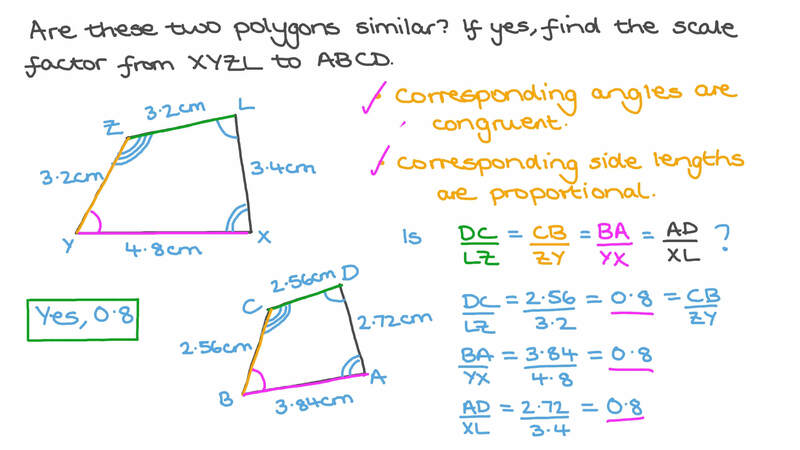 If the two following polygons are similar, find the value of 𝑥 . If 𝐴 𝐵 𝐶 𝐷 𝐸 ∼ 𝑃 𝑄 𝑅 𝑆 𝑇 , find the scale factor of 𝐴 𝐵 𝐶 𝐷 𝐸 to 𝑃 𝑄 𝑅 𝑆 𝑇 and the perimeter of 𝑃 𝑄 𝑅 𝑆 𝑇 .
AThe scale factor is 3 2 , and the perimeter is 78. BThe scale factor is 3 2 , and the perimeter is 117. 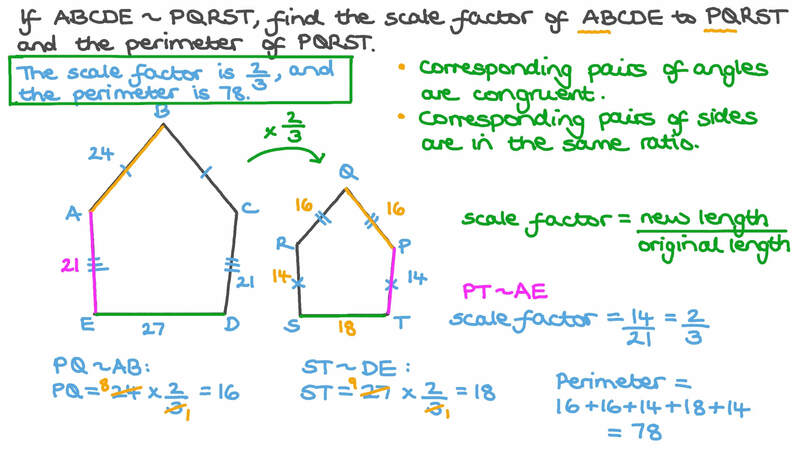 CThe scale factor is 2 3 , and the perimeter is 64. DThe scale factor is 1 4 2 7 , and the perimeter is 60.7. EThe scale factor is 2 7 1 4 , and the perimeter is 117. If two triangles are similar, then their corresponding angles are . If △ 𝐴 𝐵 𝐶 ∼ △ 𝑋 𝑌 𝑍 , find the lengths of 𝐵 𝐶 and 𝑋 𝑍 . Find 𝑚 ∠ 𝐶 + 𝑚 ∠ 𝐷 + 𝑚 ∠ 𝐸 . Are these two polygons similar? If yes, find the scale factor from 𝑋 𝑌 𝑍 𝐿 to 𝐴 𝐵 𝐶 𝐷 . If 𝐵 𝐺 𝐶 𝐷 ∼ 𝐿 𝑌 𝑁 𝑍 , then 𝐵 𝐺 𝐶 𝐷 = … 𝑁 𝑍 . Given that 𝐴 𝐵 𝐶 𝐷 ∼ 𝐸 𝐹 𝐺 𝐻 , determine the length of 𝐺 𝐻 . Given that 𝐴 𝐵 𝐶 𝐷 ∼ 𝑍 𝑌 𝑋 𝐿 , find 𝑚 ∠ 𝑋 𝐿 𝑍 and the length of 𝐶 𝐷 . If 𝑚 ∠ 𝐵 + 𝑚 ∠ 𝐶 = 1 4 5 ∘ , find 𝑚 ∠ 𝑋 . If △ 𝑋 𝑌 𝑍 ∼ △ 𝐴 𝐵 𝐶 , 𝑚 ∠ 𝑌 = 2 6 ∘ , and 𝑚 ∠ 𝐶 = 6 6 ∘ , find 𝑚 ∠ 𝑋 . A college professor was using a projector to give his lectures. A slide whose dimensions are 11 inches wide and 7 inches high was projected into an image that was 5 3 1 2 inches wide. Find the height of the projected image. Given that the rectangle 𝐴 𝐵 𝐶 𝐷 is similar to the rectangle 𝑋 𝐵 𝑍 𝑌 , find the length of 𝑋 𝑍 . A rectangle that is 15 by 10 is similar to a second rectangle with perimeter 40. Find the length and the area of the second rectangle. The image of a shape has a perimeter of 40 following a dilation by a scale factor of 1 2 . What would the perimeter of the original shape be?